Last Saturday’s devastating attack at the Tree of Life Synagogue in Pittsburgh sent shock waves through the Jewish community. We extend our deepest condolences to our brothers and sisters in the Jewish community as they begin to come to terms with this senseless, anti-Semitic violence. 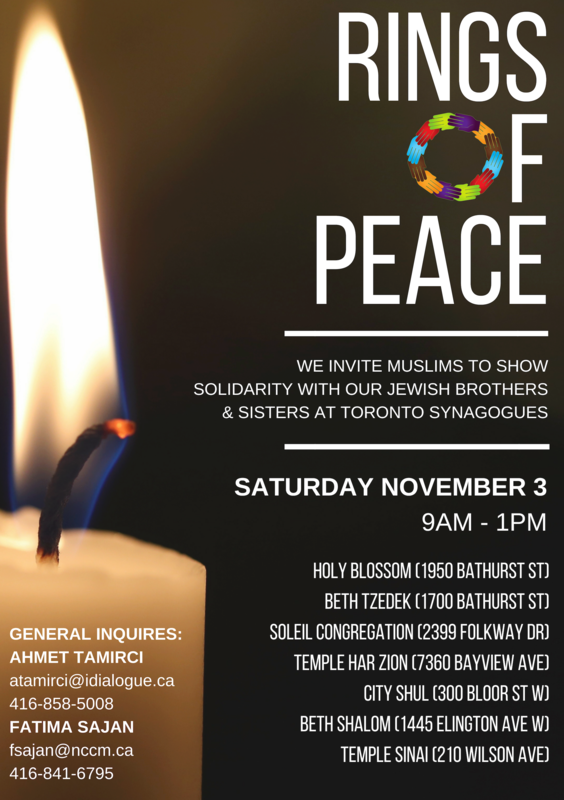 Our communities know all too well what an attack on a place of worship can feel like. At this very difficult time, we stand shoulder to shoulder with our Jewish brothers and sisters in their time of need, just as they stood alongside us after the Quebec mosque shooting nearly two years ago. 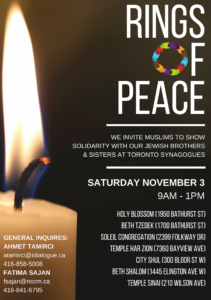 To demonstrate this solidarity, a number of Toronto mosques and organizations will form rings of peace around local synagogues this Friday, November 2 and Saturday November 3 in locations around the GTA.Participants from all faith and non-faith backgrounds are welcome to join.